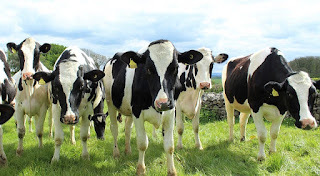 CraigardCroft: Are farmers themselves spreading bovine tuberculosis (bTB) in the UK? Are farmers themselves spreading bovine tuberculosis (bTB) in the UK? The UK farm census figures for June 2015 showed that the average yield of a dairy cow was 7,912 litres. If a cow produces 7.9 tonnes of milk a year it also produces roughly 7.9 tonnes of excrement, urine and dirty water each year. This is usually stored in a slurry lagoon until it is convenient to spread it on grass land or maize stubble. Dairy farms are usually stocked at about one cow to each acre, each acre provides grazing and silage for a year. So we have 16 million tonnes of really nasty stuff ( slurry) being spread on 2 million acres of farmland or 8 tonnes to each acre devoted to milk production. This doesn't include the slurry from beef cows . In the UK as a whole there are approximately 200 packs of fox hounds recognised by the Masters of Foxhounds Association, 150 of them are in England and most hunt on horse back. From early September until Spring there are 200 packs of hounds running around on the 4 m acres of farmland treated with slurry and also on the adjacent land. There are also wild animals, badgers, foxes, deer etc.running about on this land. It seems reasonable to ask, could the slurry spread by livestock farmers be contributing to the spread of bovine tuberculosis? I did a search of the literature and the answer is, yes.